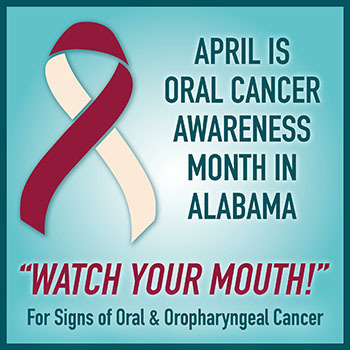 April is Oral Cancer Awareness Month, and the Mitchell Cancer Insitute in collaboration with the Oral Health Office would like to remind you to Watch Your Mouth! Take action to prevent oral cancer by performing your own 7-step self exam in between dental visits. For more information on oral cancer screenings visit the National Cancer Institute . National Dental Hygiene Month (NDHM) is kicking off, with its continuation of last year's family-focused theme "A Healthy Smile Lasts a Lifetime." Every week in the month of October is dedicated to a different event, each one celebrating various aspects of dental hygiene - from the dental hygienist to community service! The American Dental Hygienists' Association is encouraging dental hygienists and other dental professionals and supporters across the country to get involved with NDHM this October to increase public awareness of the oral health - total health connection and the importance of educating the entire family on situations which impact their oral health. It is imperative to start early with a daily oral care routine to help prevent cavities and periodontal disease. NDHM is the perfect time to spread that message even more - while celebrating the profession of dental hygiene! Ready to quit tobacco, but not sure where to start? The AL Quitline is a FREE service which offers free coaching, support, and various cesation products to help you finally quit. Visit AL Tobacco Quitline or call 1-800-QUITNOW for more information. The Pregnancy Risk Assessment Monitoring System (PRAMS) is a joint research project between state departments of public health and the Centers for Disease Control and Prevention (CDC). On a personal level, moms can positively influence the success rate for future healthy pregnancies and deliveries by sharing their experiences with the PRAMS program. All information is kept strictly confidential. Mothers are randomly chosen from reported Alabama births to participate in the PRAMS survey. Mothers who complete and return the survey may choose a gift as a token of our appreciation (diapers, manicure set, insulated cooler, or PRAMS branded onesie). For more information, please visit PRAMS or call (334) 206-2923.